Bleeding Heart Plant – Lamprocapnos spectabilis. 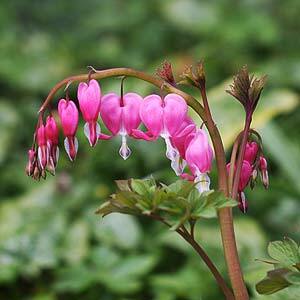 One of the mostv attractive perennial plants for a woodland or cottage garden is the Bleeding Heart Plant, Lamprocapnos spectabilis. Previously known as Dicentra spectabilis, this is a spring flowering plant that is grown for the heart shaped flowers that hang beneath long arching stems. Being a perennial they will reappear each year, and over time these beautiful plants get bigger and better. You can grow them in the garden, or in containers and you should plant them in a position where the soil is moist and they get some protection from the afternoon sun. Choose a position in part shade where the plant will not be disturbed, dig the soil over well and add some well rotted compost and aged cow manure. If you are growing these plants in pots or containers provide similar conditions. After preparing the soil, you are ready to plant your Bleeding Heart plant. Plant at the same depth it was in the container. Mark the position so you do not disturb the roots while the plant is dormant. Mulch around the plant with well rotted compost and some aged cow manure. Use an organic mulch that breaks down quickly. In spring, as the foliage first appears, fertilise with a liquid fish fertiliser or other organic fertiliser. Keep moist through spring and summer if rainfall is not adequate. Let the foliage die right back and then apply a light organic mulch again. Common Name – Bleeding Heart. Position – Dappled shade to afternoon shade. Soil – Humus rich, moist, and well drained. Height – To around 1 metre, often less. Spread – To around .5 metre in an established clump. Flowers – Pink with white heart shaped flowers. Flowering time – Spring to early summer. Foliage – Ferny and mid green. Large range of rare plants, bulbs, trees and shrubs for sale online from our Southern Highlands NSW nurseries. Specialising in growing and selling Rare and Unusual Trees, shrubs Perennials Bulbs and Climbers, a unique nursery with amazing stock.